The internet is buzzing this morning with the latest from Walt Disney World! As of May 1st, 2019 there are three major changes to the Walt Disney World Parks. One of which is the size of strollers. You can read about other two changes here. What does the Policy Say? As a mom of three children ages 5 and under, I must admit I had an initial panic when I heard there were new guidelines for stroller size. Strollers are important for a successful (full day) at Disney. I’ve been known to ditch the stroller a time or two, ultimately I beleive that strollers are an important piece of equipement at Walt Disney World. My friend Keri did a post not too long ago asking our group of Disney Mom’s what stroller they recommend for Walt Disney World. In that post, I recommended the City Select I love my City Select, It’s absolutely perfect for a family with mulitple children. However, when I saw the dimensions, I knew it was likely not going to be suitable for the new guidelines. The guidelines state that the stroller must not be longer than 52 inches and wider than 31 inches. So, does my favorite stroller fit with the new guidelines? Yes – but barely. I measured my stroller the old fashion way (with a tape measurer) and my favorite stroller is almost too big for Walt Disney World. It measured at exactly 52 inches long. 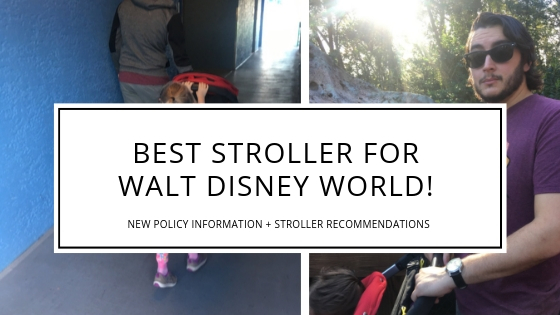 Since my City Select is a little on the large side, and if I’m being honest it can be tricky to maneuver with large crowds, here are some options for strollers that fit the new WDW Stroller Guidelines. If I had to pick an absolutely favorite double stroller for maneuverability, it’d be the BOB brand. I trained for my first Marathon with a BOB stroller and the quality of this stroller is absolutely worth the investment. I found this stroller while search “slim double stroller” on Amazon. It fits well under the new stroller guidelines but has very limited storage space. I think it would be perfect if you have smaller children, but I’m not sure an older child would fit comfortably in this stroller. It’s worth a look – the reviews are mixed. |UPDATE: Jennifer from https://lovedwellshere.com/ has this stroller and says it surprisingly has more storage than you’d think and recommends it to other moms! If you are looking for a more simple umbrella type stroller for two, you might check out this one. I love that the canopy has a UPF50+ sun canopy. As we all know, protection from the sun in the Florida heat is so important. Especially for our little ones. This stroller was released just after I had my third baby. I didn’t purchase it because it didn’t have enough reviews. Would you believe I still think about this stroller? I don’t regret purchasing my City Select for a minute but I do seem to have a silly fascination with this stroller. It just looks so amazing! Perfect for families with older and younger children who still need a stroller for little rests. This stroller would not work if two of your children needed to nap at the same time. This post focused a lot on double strollers. Simply because the new policy has really affected those of us who still require a double stroller for the parks. If you double stroller is too large for the parks. I might also recommend a single stroller and a great baby carrier. When we traveled to the parks with an infant and 2 year old we typically only took one stroller and our favorite baby carrier. The Lillibaby is amazingly comfortable and even has a zipper pocked large enough for your phone, a snack and a small wallet. It’s perfect for being hands free! Here are several options for single strollers! The City Mini is one of the top recommendations among my mom friends. It’s even the stroller my sister purchased when she was expecting her first. It’s lightweight, easy to steer and comes in adorable colors! Graco Strollers in general are great because of their amazing storage. Baby Trend is known for their affordable options. At less than 200 dollars, this is a great alternative to some of the more expensive jogging style strollers. I certainly couldn’t do a stroller recommendations list without mentioning the UPPAbaby CRUZ these strollers are so sleek and beautiful. It’s a little on the pricy side, but a stroller is an investment for many years. You want to purchase one that lasts. Umbrella strollers are perfect for families who don’t need a lot of space for diapers and supplies. But, do require a place for an older child to sit and rest for a bit during a long fun day at the parks!